It’s such an obvious thing, so maybe that is why no one mentions it. I doubt that is the reason, however, because doing so isn’t a mystery so much as narrowing down suspects. That is why when talking about the so-called natural rate of interest, or R* (r-star), the issue is (intentionally) cloaked in the language of the very long run. Pay no attention to that big decline and the timing of it; instead worry only about economic trends that predate the internet. 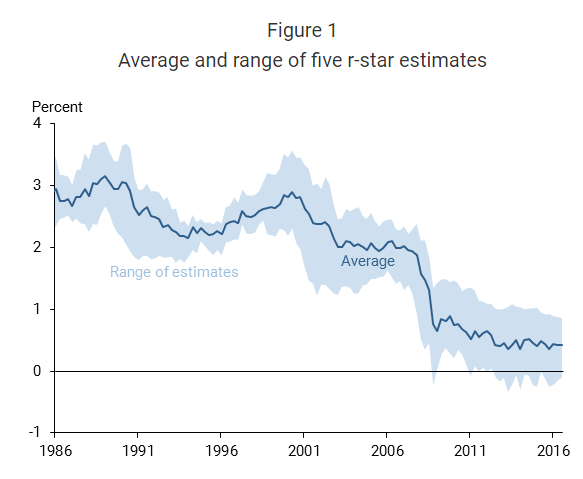 San Francisco Fed President (and CEO) John Williams has been carrying the torch of R* ever since it was updated to econometrics at the dawn of the 21st century. The idea was a 19th century one, where Swedish economist Knut Wicksell theorized an equilibrium interest balancing with commodity prices. At this harmonizing point, the economy might grow without sparking inflation, which for a central bank would be pure magic – if it could ever be found, further assuming such a thing would ever exist. That is the primary problem with R*, as why would any complex economy feature just one equilibrium rate of interest; and even if there was one, why would it be stable for more than just a few minutes, let alone months or years? Economists like Williams recognize that even in their quest for it, R* must in the long run move around. In trying to reverse engineer the thing, for it isn’t something that can be observed, the literature especially out of San Francisco has found global coherence with it. In other words, not only has R* fallen in the US, it has done so everywhere else these economists have studied. Such synchronization should raise alarms, but does not. Instead, there is rarely much mention of how that could realistically occur as well as trying best to, as stated above, ignore the blaringly obvious timing.